Is there a better alternative to DVDAttache? Is DVDAttache really the best app in Home Inventory category? Will DVDAttache work good on macOS 10.13.4? DVDAttache is a cross-platform (Java) DVD management program that integrates with Amazon (US, UK, DE, and JP ). It allows you to manually add your DVD titles or search for them using the integrated Amazon search. You can then add all the movie details directly from the search results without the need to manually type any of the information. Additional features include filtering, custom categories, personal ratings, actor listings, and a simple loan manager. DVDAttache also integrates with Amazon Selling options, so you can quickly put up any DVD for sale. Version 3.9 This is primarily an update for Java 1.5 (5.0) support. It does correct a small problem with Amazon cast lists and removes IMDB support. DVDAttache needs a rating. Be the first to rate this app and get the discussion started! Quick-Add feature lets you check items in a list of popular titles to rapidly populate your database. 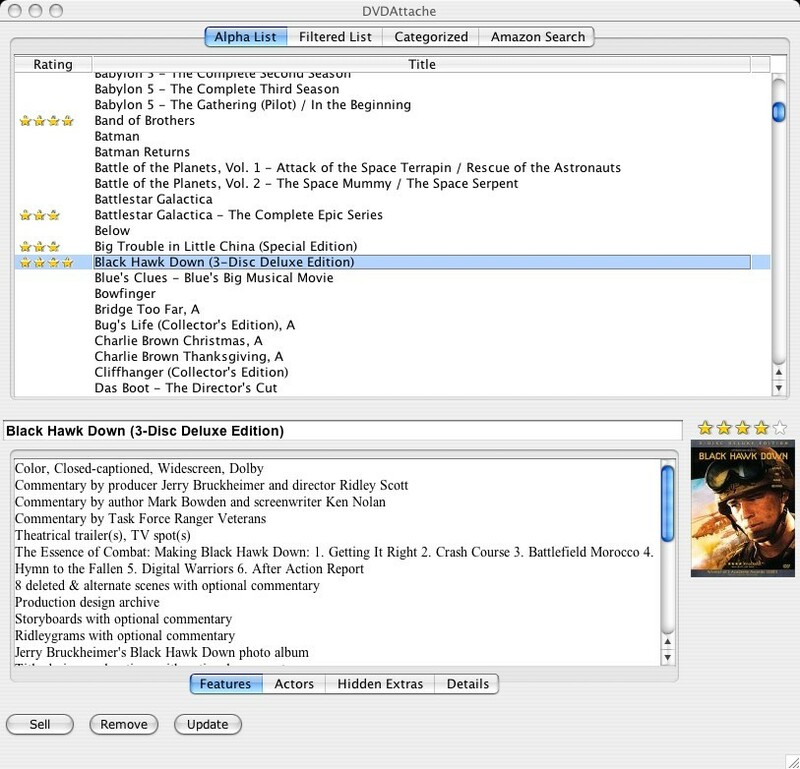 Integrated Amazon searching that provides keyboard-free entry of new DVDs into your collection. DVD information captured includes relevant technical information, director, cast list, plot description, list of features, and small and large images of the DVD box cover. Categorize each DVD by Genre for easy organizing and browsing. Custom filters allow you to control the presentation and reporting of your collection by whatever criteria you define. Ability to tag DVDs as loaned out to friends with pop-up reminders when they are due back. Limited support for non-US Amazon locales that support Web services (currenly UK, Germany, and Japan). DVD data stored in industry-standard XML format, suitable for import into other applications. Reports to printer, PDF, or HTML. Web Builder tool for generating Web pages from your collection. Wish List management with mult-item shopping cart support for Amazon.